If you choose to stay later than your check out time as a day visitor, you still must check out of your accommodation by 10.00am. One night’s accommodation will be charged if less than fourteen (14) days notice of the cancellation is received from arrival (low & mid seasons). Full refund, less $20 administration fee will be made if cancelled greater than fourteen (14) days from arrival (low & mid seasons). If paid by credit card, the surcharge is non-refundable. No refund or credit transfer given on peak season bookings. Park Management reserves the right to relocate or cancel any bookings at its discretion. All cancellations must be made in writing directly to the park. Note 1: Please be advised all rates quoted for two guests unless otherwise stated. Additional persons will incur a fee, these include; Adult 16+ years, Child 2-15 years. Note: Infants (under 2 years old) are free of charge. Note 2: Please be advised; Work Law Health and Safety state that operators must comply with the Australian Standard AS?NZS 4220:2012. ‘Children under the age of nine (9) years are not permitted to use the top bunk; children must not play on top bunk’. Please take this into consideration when making your booking. Note 3: Accommodation discounts i.e. 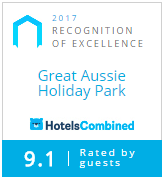 any membership club inc. Top Tourist will not be honoured for bookings made by Great Aussie Holiday Park website or any other third party websites. Membership Club discounts are accepted for bookings made direct with the property i.e. Telephone or email. Top Tourist discounts are honoured for bookings made via the Top Tourist website. We are unable to accept Diners credit cards. If you order your groceries online through Woolworths supermarket for delivery to our Park, please ensure your delivery time is booked for the day of your arrival any time after the checkin time of 2pm. We are unable to accept your groceries earlier than the day of your arrival as your booked accommodation may not be available prior to your checkin time.